I wasn’t preaching this week, but I found this sermon that I preached on the same Sunday three years ago. The gospel reading is Nicodemus visiting Jesus by night. In the Genesis reading we hear about Abram being told to pack his bags and go off to a far country, and then Paul tells us that it was Abraham’s faith that saved him, not his works. We don’t, on the whole, like asking questions – after all, we don’t want to show how ignorant we are. We like people to think that we know all the answers. Fortunately for us Nicodemus was one person who knew one thing for certain – he knew he didn’t know all the answers. Far from it, and unlike most of the other religious leaders who had already decided what the answers were about Jesus – that he was a dangerous false teacher who had to be silenced – Nicodemus found that Jesus left him with questions. So Nicodemus went to visit Jesus to see if he could get some answers. Now, I’m always happy to answer questions, if I can, about faith. I sincerely hope, though, that nobody here will decide to follow the example set by Nicodemus in today’s gospel reading. Please – don’t start coming to the Vicarage, like Nicodemus in the middle of the night, so that no-one else will see you. The gospel writer doesn’t tell us what Jesus thought but he would, presumably, have been asleep and there is no indication that he had made an appointment beforehand! We presume Jesus didn’t mind but I wouldn’t mind betting that the disciples had a thing or two to say about being woken up by this Pharisee who had come with his questions – why couldn’t he come at a more reasonable time of day. Before we go on to think about Nicodemus a little more I’d like to introduce you to Vincent Donovan. 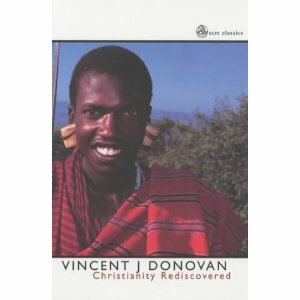 Vincent Donovan is an American Catholic missionary – and I would be surprised if any one here has heard of him. In the 1960s he went to Kenya to work as an evangelist with the Masai tribe. He is well-known to me and to many who have trained for ministry because his book “Christianity Rediscovered”, in which he records his experiences, is required reading on theological courses. The book is a profound and thought-provoking classic of modern missionary writing. Some ordinands who have read it have even called it “life-changing”. Superficially just a good missionary story, about how one man brought a number of groups of the Masai people in Kenya to Christian faith, it is something much more than that. For in what the author says about the method and content of evangelism; the meaning of the Eucharist; and the nature of ministry, we are led back to the question our understandings of the mission of the church in all its contexts. For Donovan, his experiences in Africa meant a total reappraisal of the meaning of his faith, and therefore a rediscovery of his Christianity. One day he was discussing the Masai word for “faith” with a tribal elder. The word Donovan had used really meant not faith in the sense that we think of it but “agree to”, which didn’t convey the full biblical idea. The elder said that the word Donovan had used was like a marksman shooting a wild animal from a distance, with only his eyes and his hand involved. Rather, he said, true believing was more like a lion catching its prey. The lion’s whole body is involved as it stalks, chases and leaps on the animal, killing it with a single blow. As the animal goes down the lion embraces it in its front paws, pulls it to itself and makes it part of itself. That is what faith is, said the elder: an embrace, not an agreement. I used to think that faith was a head trip, a kind of intellectual assent to the truths and doctrines of our religion. I know better now. That was just the discovery Nicodemus made, in our Gospel reading. Nicodemus was a sincere man. He believed the doctrines and practiced the customs of his religion. But he was puzzled because God was obviously working through Jesus, who was unorthodox by any standards. How could God use a person like that? Nicodemus was a Pharisee, and the Pharisees lived by the religious rule book. They had devised 613 rules to help people keep the Old Testament law and so stay right with God. It was a neat system. It made religion easy, because you never had to think about it – you just kept the rules. But in practice it made religion what Donovan called a head trip, and faith a checklist of burdensome duties. There was no real embrace of God, just an acknowledgement that he existed and required people to obey certain rules – rules that were often, of course, not set by God at all but by the religious leaders. Jesus, by contrast, said that faith was a personal relationship with God, embracing him, as a child with a parent. There was a place for rules, but also for love. A relationship based on rules alone is more slavery than personal rapport. Nicodemus’ could see that, but faced the dilemma of how to move from belief in the head to trust in the heart. In response, Jesus gave his famous teaching about being “born from above”. Now this is one of those classic phrases from the New Testament that is mistranslated and misused. In many versions you will read “born again” and certain parts of the Church speak about how everyone must be “born again”. But the writer doesn’t say that. The word he uses always means “from above” – and that’s important. Jesus meant that everyone needs a new start. Not the sort that’s just turning over a new leaf, or trying harder to do our duty – that was the way of the Pharisees. He meant something more like the story of Abraham who simply surrendered himself to God’s will. Abraham left home when God told him, not knowing where he was going, yet believing God’s promises. That was true faith – embracing God in a personal, trusting way. And when we do that, it’s as if he becomes part of us. It is quite plainly the invasion of their lives by a new quality of life altogether. They do not hesitate to describe this as Christ “living in” them. That is what being “born from above” is about – allowing Christ to come and dwell in us, to fully embrace us, and allowing ourselves to fully embrace him . Not just to know him or know about him, but to be at one with him. That’s the new start Nicodemus needed – and like many of us he found it hard, because he wanted to keep control. He had to let go of his activism and let God take over his life. And so do we. The process starts when we admit honestly that we prefer the head trip to the heart‑centred relationship and that we’ve got it wrong. The head trip is more comfortable; we control what we believe and do. Having admitted it, we need to let God take control of all we think and do. Then we need to confess to another shortcoming: we can’t make this new start on our own. We need the help of God’s Spirit. That’s what Jesus meant by being “born from above” – being invaded by God’s living presence, giving us the spiritual resources to do what we can never do on our own. It seems that Nicodemus was able to make this new start. He appears twice more in the gospel. He later shows courage by standing up for Jesus by protesting at the move to condemn Jesus without giving him a hearing. And at the end of the gospel we are told that he brought a lavish gift of spices to anoint the body of Jesus after it had been taken down from the cross. He no longer felt the need to be secret but was prepared to openly identify himself with Jesus in spite of the opposition of his fellow Pharisees. Indeed, in Christian tradition Nicodemus is the one who removed the nails from the hands and feet of Jesus. Of course, we all need lots of new starts. Sometimes, our terminology of “being born from above” obscures the fact that birth is a process. Life doesn’t begin at birth, but at conception, and birth itself begins a long process of growth. In the same way, our spiritual life began long ago, but sometimes needs a fresh start for it to really take off. So let us lay our lives before God today, hand over the controls, embrace him, as it were, and receive a fresh invasion of his love, life and power to become the people he wants us to be.